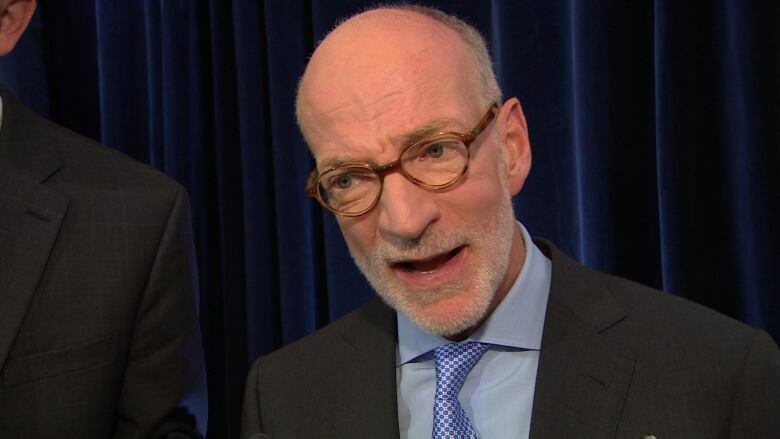 The head of the CBC is hitting back at Conservative Leader Stephen Harper over comments the national broadcaster is floundering because of low ratings rather than a lack of funding. "It's not about a lack of audience," he said after the CBC's annual general meeting in Winnipeg on Tuesday. "It's about a broken finance model that doesn't work, that used to be built on advertising revenues supporting a drop in parliamentary appropriations. In this environment, it doesn't work anymore." Harper told a private radio station in Quebec that the CBC's budget crunch isn't due to government cuts, but because of its low ratings. "The reason for the difficulties aren't the cuts," Harper said in an interview broadcast Monday. "There aren't cuts. The reason is the loss of [CBC's] audience. It's a problem for the CBC to fix." Lacroix wouldn't answer when asked whether he thought Harper's comments were fair. "But I'm going to tell you it's not because of our ratings that we have a problem at CBC-Radio Canada." Canada must look to other European countries for ideas on how to fund public broadcasting, Lacroix suggested. France and Spain collect revenue from internet service providers, while the United Kingdom uses a licensing system based on the purchase of a television to raise cash. Supporters of the CBC rally outside the University of Winnipeg on Tuesday, just before the broadcaster's annual public meeting was held there. The rally was organized by the Friends of Canadian Broadcasting. (Trevor Brine/CBC)Germany has a household fee, which others are interested in adopting as people increasingly turn to digital platforms, Lacroix said. "People are no longer buying television sets. We should have a conversation about what's the best funding model for us. We can't continue in this environment." Lacroix said that contrary to claims by the union for CBC employees, the broadcaster is not planning a "fire sale" of its property, but will consolidate where it makes sense. "For 80 years, the government has funded the CBC. It has given it a set mandate that the CBC has to comply," she said. "For Mr. Harper to suddenly say the problems are not a result of his funding cuts boggles the mind. "The CBC is in a funding crisis. It has all these programming responsibilities and it just can't keep doing them with the funding at the level that it's at."